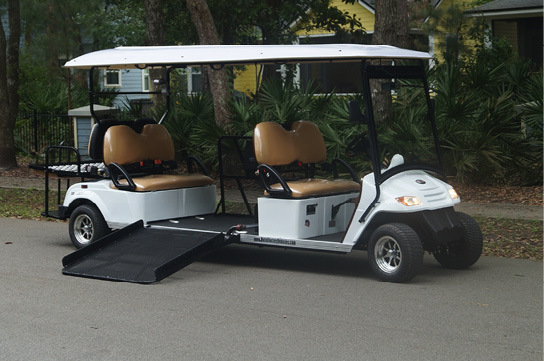 Most of the time our industry focuses on golf cars tailored to a variety of recreational uses. But golf cars also have a practical side and have a lot going for them in the industrial and commercial sector. They easily maneuver in tight or crowded spaces, are highly customizable, and have lower operational costs than larger service and utility vehicles. As more people realize how versatile golf cars can be, the more amazing uses for these hard-working vehicles crop up. 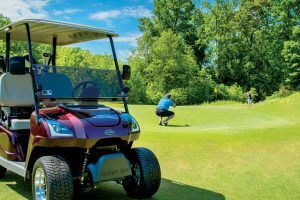 This month, Golf Car News takes a look at the roles of golf cars in industrial and commercial industries, how these specialized cars are at the core of event infrastructure, and how people keep innovating to create custom cars for countless opportunities. As more municipalities adopt laws for street-legal golf cars, people are discovering an ever-expanding range of car customization to accommodate their industrial and commercial business needs. The range of applications is extensive, and requests for highly specialized vehicles increases each year. When Moto Electric Vehicles started their custom electric vehicle and golf car business eleven years ago, they produced 60 vehicles that first year. In 2017, they are slated to sell around 450 custom vehicles, including everything from basic four-passenger cars with cargo boxes for General Services Administration (GSA) contracts to handicap-accessible people movers for theme parks. What is the secret to building an international business that creates custom cars that run the gamut from shuttling passengers between airport terminals to providing ice-cold drinks to high school students? “We don’t say no,” says Brett Jackrel, sales manager of Moto Electric Vehicles. “We adapt the vehicles to our customers’ applications. If someone wants headphone jacks to give a tour, I have the staff to do it. We have a licensed electrician and licensed master auto mechanic on staff.” This strategy has served them well, and as a result, Moto Electric Vehicles has the know-how to offer these one-off requests to other customers as part of their expanding expertise. 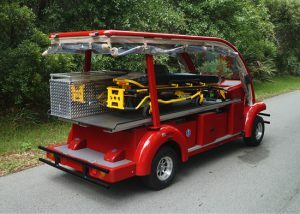 6 passenger wheel chair golf car featuring a hydraulic ramp. An industrial car’s versatility is most apparent at large events where a strong infrastructure is needed to support logistics. Chances are, within the city-like infrastructure of operations, golf cars are at the core. 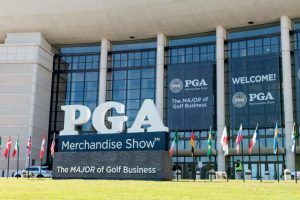 Events like golf tournaments can require upwards of 500 cars on hand to facilitate behind-the-scenes jobs, with larger golf car dealers ready to rent over 1,000 cars for special events. Sporting events and festivals prefer security and emergency cars like the ones Moto Electric Vehicles build because of mobility and approachability. 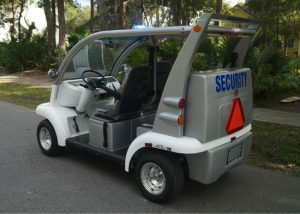 In fact, Miami/Dade County has a Special Events Unit made up of officers using custom police golf cars. This unit provides police and security support for all major events in the area. Who needs a golf car? There is much more going on behind-the-scenes at a golf tournament than meets the eye. From replenishing food and merchandise supplies to transporting media and security, golf cars are the most efficient and versatile way to keep an event going strong. 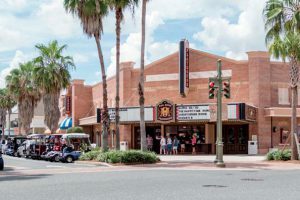 One thing that strikes a chord is that no matter how industrial or commercial the car might be, the use almost always has a link with the community. While industrial and commercial cars work together to serve big events, the innovative requests Jackrel and his team receive for customization prove that these cars offer an impactful way to serve a specific need in the community. As Jackrel shares the range of his company’s products, he points out a delivery car with a heater and shelves inside a large enclosed diamond-plate box. The purpose: a retirement facility uses the car to serve hot meals to its senior citizen residents. Whether they help to improve common areas, provide event support or deliver warm meals, the industrial/commercial car is not that far off from its recreational cousin – by helping people and bringing them together on and off the course. Food delivery car with built-it heaters. Moto Electric Vehicles is a family-owned and operated manufacturer and wholesaler of street-legal electric vehicles and golf cars. 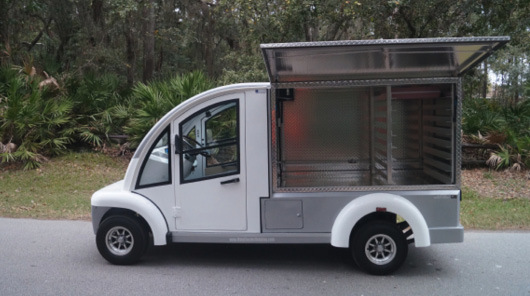 They specialize in customizing street-legal carts, electric utility vehicles and low-speed shuttles to fit each client’s unique needs including custom paint jobs, aftermarket lift kits, lightweight aluminum wheels, special lighting, ADA ramps and other customized options.